I was feeling the urge to shop a few days ago, but I told myself I had to keep it cheap. Now, if there’s anything you need to know about me, it’s that I have a knack for finding the hidden gems of the sales racks at just about any store. So while once in a while it’s nice to splurge on something I really want, I can still shop in between without feeling too guilty about my spending. First, I got three tops on clearance: a pink T-shirt and two lace tops. The pink tee is super soft, and I think it will go with just about anything during the summer. Also, it was $4, and who says no to a $4 T-shirt? 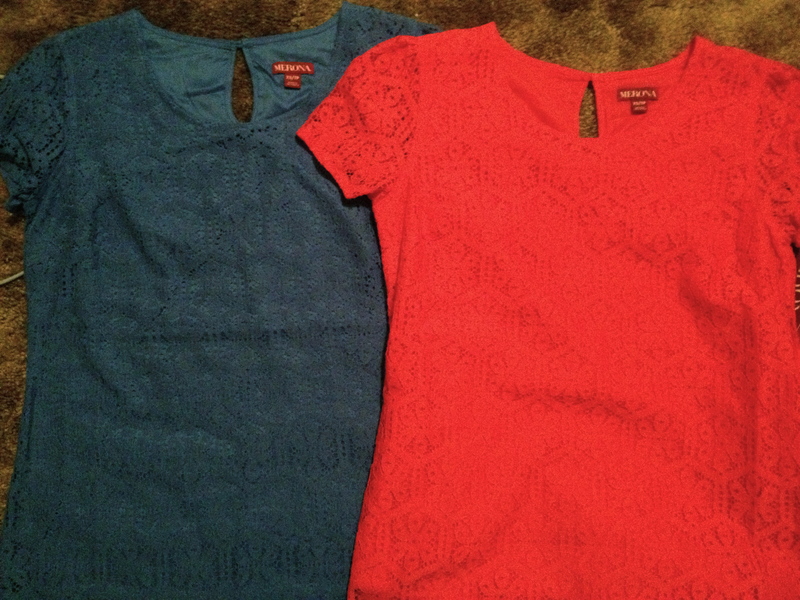 One is bright red and the other is a mild blue (not as teal as in the photo, closer to cornfield blue). I absolutely love these because they’ll go with any pants and skirts, and they can easily be dressed up or down. I also love that they’re both bright but not too overwhelming for layering and accessories. 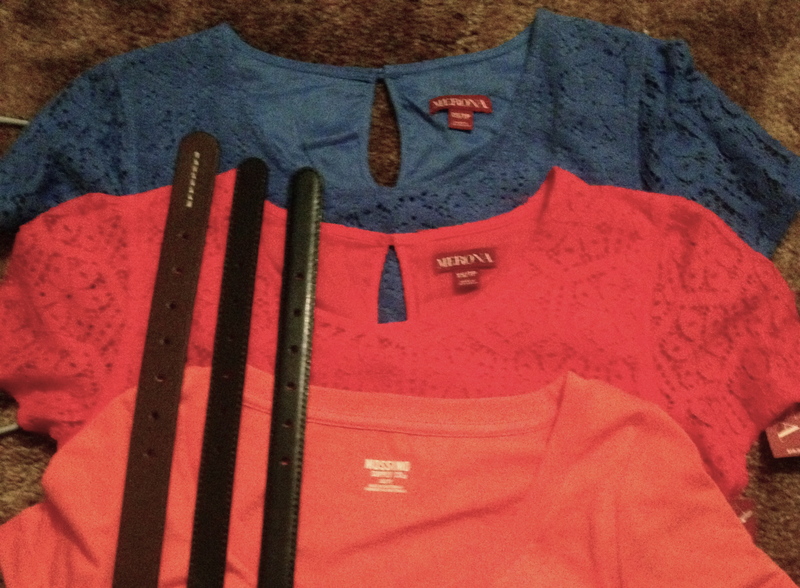 I really needed more multi-use clothes in my closet, so these made me very happy. Oh, and did I mention that they were only $10 each? That’s nothing for how much I’m going to wear these! So after scoring big on clothing, my mom and I wandered a bit longer and ended up looking at the belts in the accessories section. I liked a few, but I’m built very small, so most of them would fit around my hips but not my waist, and why spend $15 on a belt that you can only get half the use out of? I also tend to use belts around my waist more often so my waist doesn’t get lost in the fabric. Now bear with me, it’s about to get weird. My mom suggested looking at the children’s section to see if there were any smaller belts that I could wear at the waist. Well, the girls’ section had a couple of options, but they were all neon with goo-gah on them. So…may as well try the boys’ section. 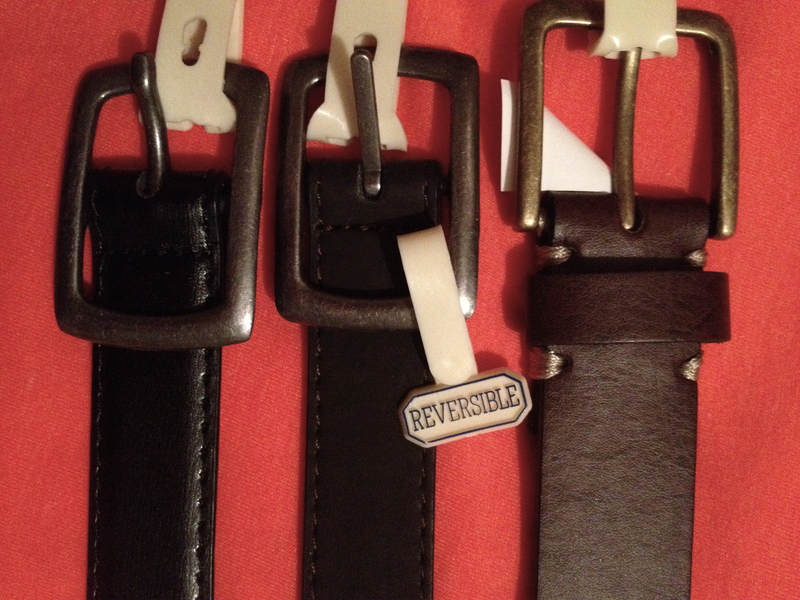 While the belts for boys are plain, they’re awesome as waist belts for a few reasons. First, you’ve got your basics covered with a few different tones and finishes to choose from, so they’ll go with everything. Second, since little boys don’t usually have much of a need for lots of dress clothes, many of these belts are reversible, so you’re getting two belts for the price of one. Third, these are made to last a while (maybe because boys break things?). I think they might even be sturdier than most of the women’s belts we were looking at in the first place. Fourth, they’re extremely cheap: $6.99 for a single belt and $9.99 for the pack of two. So, what would have cost $45 in the women’s section was only about $17. The single belt is a really beautiful rich brown. The double set contains a typical black “leather” belt with a semi-shine finish, and a reversible matte brown and matte black belt. The brown side feels almost like suede, and the black side is smooth. These will definitely be in future OOTDs! For sizing purposes: my waist is 24.5 inches, and medium and large both fit around comfortably. I opted for the large belts so they would fit around layers (and maybe my hips on the first hole), and so I can still wear them if my weight changes. I bet an XL would have fit around my waist and hips, but I don’t like having 6 inches of belt hanging from my waist, especially when it’s not the kind of belt that would do well with a knot of some sort.